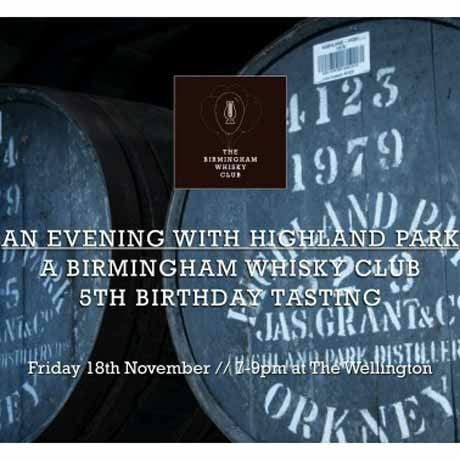 The Birmingham Whisky Club would like to invite you to to join them at The Wellington on Friday 18 November 2016 for 'An Evening With Highland Park'. Learn about their delicious whiskies, the history of the brand and taste through a selection of their delectable drams. Highland Park's method is based on five keystones: hand turned malt, aromatic peat, cool maturation, Sherry oak casks and harmonisation. Each individual batch of Highland Park is drawn together from a variety of cask types, contributing to an array of distinct, unique flavours and additional harmonisation for up to six months. which perfectly marries them together. The impact this marriage has on the whisky is nothing short of stunning and ensures consistency, as well as adding complexity and exceptional balance on the palate. Since being named 'The Best Spirit in the World' (three times), Highland Park has also received World’s Best Single Malt for Highland Park 21-year-old and the Ultimate Spirit in 2013 for Highland Park 25-year-old. This is the first time a spirit has been awarded a full 100-point score in the Ultimate Spirits Challenge. The rich, succulent, complexity of this exceptional single malt inspires passion in single malt enthusiasts everywhere. It has balance, character and provenance and, in that, epitomises all that is great about single malt Scotch whisky. Learn more about these whisky icons with Joe Ellis, whisky expert and brands development manager from Maxxium and 'the masters in whiskies', as you taste through a delectable selection of six drams, with the fine folk from Highland Park. With this fantastic line up being priced at around £750, we can guarantee you're going to fall in love with Highland Park. 7pm - Tasting begins. You will be led through a selection of different drams by the experts from Highland Park and get a chance to ask all of your burning questions throughout. 9:30pm - Although the tasting is over, please feel free to stick around. Anything you were afraid to ask? Grab our resident experts and have all of your queries answered. No refunds or transfers. Events is strictly over-18s only.